No matter how organized you are there is usually someone extra you need a gift for. Before you rush out and buy something, take a look at this list of quick, easy and budget friendly gift ideas. The best shortbread ever! And it's easy too. 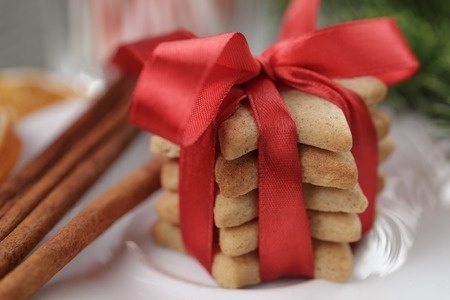 Use a star shaped cutter to cut out the biscuits, then when they are cooked and cooled stack six in a pile and tie with red ribbon for a festive look. Pre-heat oven to 170 degrees Celsius. Beat together butter and sugar until light and fluffy. Sift flours together. Using your hands gradually work the flours into the butter mixture until combined. Knead on a floured surface until smooth. Roll out to 2cm thick. Cut into fingers or circles. Put on buttered biscuit trays. Prick tops with a fork. Sprinkle with castor sugar. Bake until firm and light golden at edges, about 20 minutes. Cool then store in an air tight tin. Takes about 10 minutes to make. Package in a large jar. Cut a topper from Christmas paper to cover the lid and tie it on with raffia, string or curling ribbon. Stick the gift label to the jar. Whip up a batch and put it in a jar. Print off the recipe, fold it into four and attach it to the jar with a ribbon. Cover the lid with paper and tie on with raffia, ribbon or string. Make a batch and put them on a doily covered paper plate. Cover with cellophane or clingwrap, stick a bow in the middle. You can include the recipe if you think the recipient would like it. This microwave fudge makes a slice tray full for around $6. Either make a batch and put it in an ice-cream container or get the ingredients and bundle them together in a small box or gift bag. Include a copy of the Tip Sheet. Fill an egg carton with potting mix or good soil from your garden. Put a seed in each pod. Use the lid of the egg carton as the tray to hold the pods. Make a plant label from an icy pole stick or cut an empty (and washed out) milk bottle into sticks. Use a permanent marker to write the plant name and pop it into one of the pods. Include the seed packet and wrap the lot in cellophane. Choose a seed that has a good germination rate (peas are ideal and grow year round). Is a bag of chocolate chips equivalent to 250g of Cadbury choc. melts? Thanks! Yes - I use whichever chocolate has been on sale, not necessarily cooking chocolate. Often the blocks are cheaper than the bags of melts/chips per 100g. The melts/chips usually come on sale around Easter time and then again in October/November so I will stock up then if they are cheap enough.